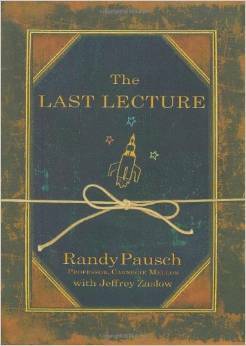 You may have heard of or even read Professor Randy Pausch’s book, The Last Lecture. It is a long standing routine at Carnegie Mellon University that the professors there are asked to give a lecture with a hypothetical stance that this will be your last chance to impart words of wisdom and what would you say. Well for Dr. Pausch his speech was not under hypothetical circumstances. He was diagnosed with pancreatic cancer and was given a preset term to live by doctors. Instead of wallowing in his diagnosed demise the professor embraced his life and spent his final months spreading his inspiration for life. Professor Pausch talked about living life fully and overcoming obstacles by seeing them as lessons on how much we want something. He discussed the important things in life and how material things don’t matter. He also talked about having patience with people and waiting for them to show their good side because he believed everybody has one. His inspiring words have touched many lives and the only lives he wished to touch are of his three young children he left behind with his wife. Professor Randy Paucsh sadlly crossed over on July 25, 2008 but his words of wisdom lives on. Gallery | This entry was posted in Be the Change Lifestyle and tagged achievements, dreams, life, live life, passion, Professor Randy Pausch, The Last Lecture. Bookmark the permalink.